Because OlyJeff asked in the comment thread, I did a similar precinct map on the park vote in Olympia. I did it measuring where the vote did the worst. So, in the map, the darker the marker, the more no votes there were. The highest no vote was just over 50 percent, so really, almost everywhere in Olympia wanted their parks to get more money. But, it is still fun to make maps. This seems like I'd pretty much expect it. Generally, the closer you are to Budd Inlet, the more you want parks. Or, rather, the more you want to raise taxes for parks. This follows the typical pattern for voting in Olympia. Progressive (because you can't just say liberal in Olympia to mean people further left) voters are thought to be in the older neighborhoods around downtown and the nearby Eastside and Westside. 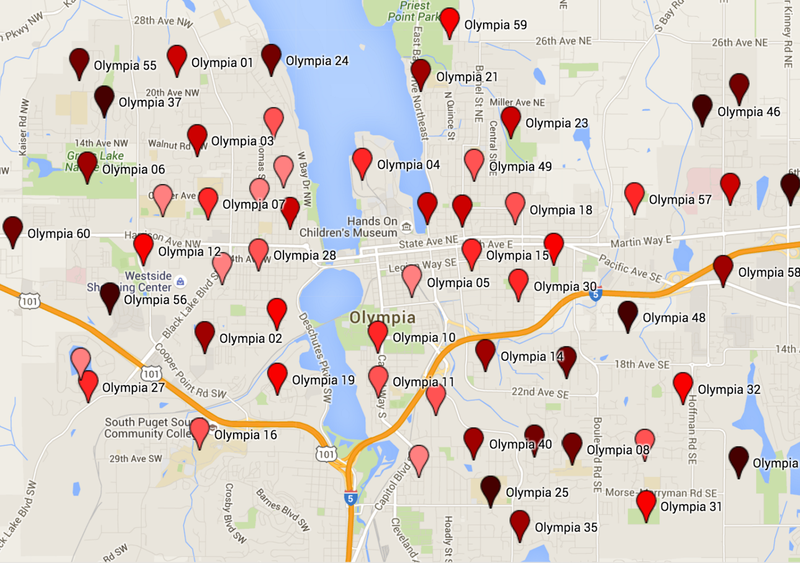 When Olympia Pop Rocks asks "Westside or Eastside" they don't mean down off Boulevard Road or out past Kaiser. There's another thing about those neighborhoods that I think might be more telling than just the way people vote on a progressive to liberal (to maybe conservative) scale. The inner neighborhoods are also generally walkable. They're older, and since people can get out and use the parks near them without getting in a car, maybe they have a more everyday experience with them. I'm just spitballing here. But, maybe a more personal "that's my park right down there" experience means you're more likely to vote for parks in general. But, this measure passed nearly everywhere, so it's almost meaningless to quibble. Lastly, you see three precincts in the far South Eastside that have lighter reds than the ones immediately around them. These are standouts on that side of town in support of the park levy. This I would say is NIMBYism at work. These are the precincts that are nearest LBA park, which has been the center of the most vocal pro-park, anti-house/neighborhood development debates in recent years. The passage of the park levy made it more likely LBA would expand, so they voted yes.